T-RackS itself sounds as great as ever, and the Custom Shop makes it fabulously flexible - can you resist buying them all? Plugins work in and out of shell. Useful standalone option. Good shell design with great metering. Well designed comparison feature. CSR modules are very flexible. Shell lacks global level control. Shop takes a little getting used to. 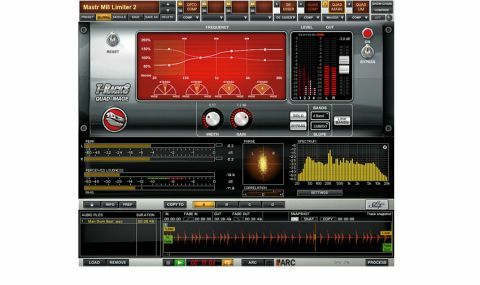 T-RackS is one of the most established and long-running brands in software signal processing, offering a solid selection of mastering and mixing devices that can be used independently or chained together within a 'shell' plugin (VST/AU/RTAS). The shell can also be loaded as a standalone application with file loading and rendering, meaning the whole setup is also suitable for use as a mastering suite outside your DAW. In fact, the very first version of T-RackS was designed purely for that particular purpose, having no plugin option. "The latest version of T-RackS sees the shell updated to incorporate IK's new Custom Shop system"
The latest version of T-RackS sees the shell updated to incorporate IK's new Custom Shop system, enabling you to demo and buy modules on a 'singles' basis. The bundled modules list also includes five new ones. These are the British Channel (an SSL- inspired channel strip) and four Quad series multiband processors: Compressor, Limiter, Image (stereo imager) and De-Esser. To recap, the other modules are the original Classic T-RackS processors (Compressor, Multi-band Limiter, Clipper and Equalizer), two EQs (Linear Phase and Vintage EQP-1A), and five dynamics processors (Brickwall Limiter, Opto Compressor, Vintage Compressor/Limiter Model 670, Black 76 Limiting Amplifier and White 2A Levelling Amplifier). Phew! Oh, and it's also updated the quartet of Classik Studio Reverbs to 64-bit and made them available in module form too (existing CSR owners can update for free). This takes the number of modules currently available in the Custom Shop to 20. As mentioned, you can use any of these modules as single plugins or chain up to 12 of them together in the shell. Owners of earlier T-RackS versions should note that the update won't remove or interfere with them at all (the new versions are labelled slightly differently), so there shouldn't be any problems with opening older sessions, so long as you still have the old version installed. T-RackS CS is available in three bundles: Classic, Deluxe and Grand, including four (just the Classics), nine and 16 processors respectively. Note that although Classik Studio Reverbs now integrates with T-RackS, none of the bundles actually include it. "Of the new modules, the British Channel strikes us as the most interesting. It's very close to SSL's E-Series channel strip"
The established modules all behave just as they always have, and - as we understand it - aside from some tweaks to the Black 76 and White 2A algorithms, they're all unchanged from the previous version of T-RackS. Our favourites include the vintage emulations (EQP-1A, Black 76, White 2A and Model 670), as well as the Opto Compressor and the excellent Clipper. The CSR reverbs are also very flexible (and often overlooked, it must be said). Of the new modules, the British Channel strikes us as the most interesting. It's very close to SSL's E-Series channel strip, although the layout has been rotated round to horizontal. All the typical SSL features are here, including EQ- or filters-to-dynamic-sidechain. There are also both brown and black LF EQ options, the latter exhibiting the recognisable, more powerful effect of the later SSL design. The plugin also successfully captures that snappy compressor design with auto gain make up and the transient-pummelling fast attack option both on tap. Three of the four new Quad modules share the same underlying multiband design. This facilitates anything from single- to 4-band operation with a globally adjustable crossover slope (6-48dB). The fourth multiband module (De-Esser) offers a maximum of three bands. In use, they're highly intuitive, with crossover points and the gain of each band adjustable in the display. Further controls sit below the display, snapping round to reflect the currently highlighted band. Some multiband interfaces can be fiddly, but IK have added an air of ease to these. Useful features include individual band bypass and solo, band linking, and M/S or stereo operation for the Compressor and Limiter. Those aside, we think the Image processor could benefit from some overall L/R balance controls and band-specific channel delay offsets. Furthermore, although we really like the sound and behaviour of the Compressor, it seems a little odd that it only has one mode of operation, based on an optical design. Our favourite of the Quad modules is the De-Esser. So many de-esser plugins seem to come up short, but this one's great and can work in both high-pass (2-band) and band- specific (3-band) modes. The latter can be very precise indeed, with steep crossover slopes up to 48dB/octave, and its broad detector frequency scale (1kHz to almost 16kHz) means you can treat all sorts of harshness as well as sibilance. The two de-ess response types and two sidechain listen modes also come in handy. One of the best things about T-RackS is that you can use its various modules both within the shell or just as single instances. As hosting shells go, this one has a lot going for it; while the routing configuration is fixed, for example, the first four slots can be put to good creative use for parallel processing of various types. There's plenty of metering onboard, too, which can be extremely useful. It would benefit from global input/output level controls, however. If you're an existing T-RackS user, applying the latest update (v4.0, to put a number on it) effectively forces you to transition to their Custom Shop format; however, the good news is that it's actually a good place to be, even if the only benefit is that trying out new modules is made much easier than before. All in all, a well thought-out and effective update.